(CNN) -- She said she was a scapegoat. She said she was just following orders. She said she was demoted unfairly. Retired Army Col. Janis Karpinski was one of two officers punished over Abu Ghraib. Now, retired Army Col. Janis Karpinski can say: I told you so. Karpinski was one of two officers punished over the aggressive interrogations at the notorious Abu Ghraib prison in Iraq. Pictures of detainees caused outrage around the world when they were leaked to the news media in May 2004. The photos showed naked prisoners stacked on top of each other or being threatened by dogs or hooded and wired up as if for electrocution. Throughout the ordeal, Karpinski maintained that she and her troops were following interrogation guidelines approved by top brass. Today, Karpinski has found validation in a few Bush-era memos released last week by the Obama administration. "The outrage was over the photographs, because the photographs were living color of what those top-secret memorandums authorized," Karpinski said in an interview Wednesday. "So, it is unfair ... the soldiers may have moved through [the military justice] system, but they never had a fair court-martial. Not any one of them, because they were condemned as one of the 'bad apples.' "
Karpinski, then a brigadier general and commander of Abu Ghraib, was demoted to colonel because of the scandal. A second officer, Col. Thomas Pappas, the commander of the military intelligence unit assigned to Abu Ghraib when the offenses occurred, was relieved of duty and fined in May 2005. Seven low-ranking guards and two military intelligence soldiers -- described by then-Deputy Secretary of Defense Paul Wolfowitz as "bad apples" -- were disciplined. The memo, by then-Assistant Attorney General Jay Bybee and then-Principal Deputy Assistant Attorney General Steven G. Bradbury, allowed the use of such tactics as keeping a detainee naked and in some cases in a diaper, and putting detainees on a liquid diet. One memo said aggressive techniques such as waterboarding, sleep deprivation and slapping did not violate laws against torture absent the intent to cause severe pain. "I will tell you that when I read those memorandums, when they were first released a few days ago, I did -- I did feel this sense of being able to exhale after five years," Karpinski said. "That is what we have been saying from the very beginning, that, wait a minute, why are you inside pointing the finger at me, why are you pointing the fingers at the soldiers here? There's a bigger story here." The Senate Armed Forces Committee released a report Tuesday, five days after the memos were released, stating that senior Bush administration officials authorized aggressive interrogation techniques on suspected terrorists, despite concerns from military psychologists and attorneys. The report points to then-Defense Secretary Donald Rumsfeld's approval of such techniques -- including stress positions, removal of clothing, use of phobias (such as fear of dogs), and deprivation of light and auditory stimuli -- in December 2002 for detainees at the U.S. prison in Guantanamo Bay, Cuba. His OK prompted interrogators in Afghanistan and Iraq to adopt the aggressive techniques. The guidance was delivered to Abu Ghraib by then-Maj. Gen. Geoffrey Miller, who was summoned to Baghdad from Guantanamo to evaluate the prison system. "We had a myriad of problems in our -- in the prison system, not with detainees who were undergoing interrogations, but with Iraqi criminal prisoners," Karpinski said. "And instead of coming to give us support, he was sent specifically to work with the military intelligence interrogators to teach them the harsher techniques that were being used down in Guantanamo." Shortly before he left office in late 2006, Rumsfeld said the day the Abu Ghraib scandal broke was the worst in his tenure as defense secretary. "Clearly the worst day was Abu Ghraib, and seeing what went on there and feeling so deeply sorry that that happened," he said at the time. "I remember being stunned by the news of the abuse." But Karpinski said the condition of detainees at the prison should have come as no surprise for the Bush administration. "I think it was torture, absolutely. You know, I was never inside an interrogation room where they were conducting interrogations, but I read the memorandums many times over," she said. "Waterboarding is torture." 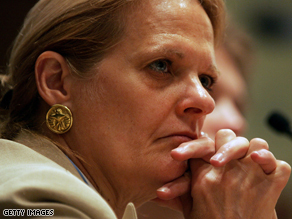 Karpinski said that while she was the commander of Abu Ghraib, she didn't personally witness any of the interrogation techniques. "The first time I saw the photographs was at the end of January ," she said. Karpinski said she was ordered by Lt. Gen. Ricardo S. Sanchez, the U.S. commander of operations in Iraq at the time, not to discuss the photographs or the investigation with anybody. Now, despite any relief felt by the release of the memos and the Senate report, Karpinski said she will have a hard time shaking off the humiliation and disgrace brought on by the Abu Ghraib scandal. "I think that, you know, you cannot dismiss five years of having to live under these accusations," she said, "and people associating my name and these soldiers' names with what they were so unfairly accused of." CNN's Rick Sanchez contributed to this report.